Nashville, TN – Ben Bracewell tossed seven shutout innings to lead the Nashville Sounds to a 5-0 win over the Round Rock Express in front of 7,923 at First Tennessee Park Sunday night. The right-hander limited the Express to just three hits and two walks while recording five strikeouts in his fifth win of the season. The dominant outing came off the heels of six scoreless frames in his last start. 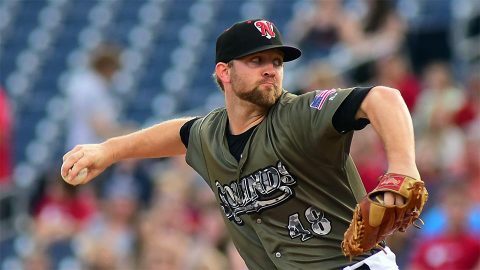 Bracewell was the benefactor of some early offense as the Sounds plated three runs in the first inning. With one out in the opening inning, Josh Phegley and Yairo Munoz collected back-to-back singles to start a rally. Joey Wendle brought in the first run of the night with a bullet to right field, plating Phegley to make it 1-0. Matt McBride followed suit with a line drive down the left field line. Munoz scored easily and Wendle raced around all the way from first to make it a two-run double and 3-0 Nashville lead. The Sounds added on to the lead in the third when Munoz singled and Chris Carter followed with a towering two-run blast to left-center. It was Carter’s second home run in as many games and seventh of the season in a Sounds uniform. The 5-0 lead was more than enough offense for Bracewell. He retired 10 straight Express batters at one point, and got some help from Joey Wendle who made a diving catch in the fifth to take a hit away from Preston Beck. Corey Walter followed Bracewell in the eighth and put up another zero. Raul Alcantara took care of the ninth with a 1-2-3 inning to keep the shutout intact. The zero put up by Nashville pitching was the 10th of the season and second against Round Rock. Munoz and Wendle led the charge from an offensive standpoint. Munoz went 3-for-4 with a pair of runs scored and Wendle notched another multi-hit game with a 2-for-4 effort. The Sounds take bragging rights over the Express into the 2017 season. The win gave Nashville a 9-8 season series win, and 105-104 edge in the all-time series. The Sounds welcome the Omaha Storm Chasers for game one of a four-game series set to begin Monday night at First Tennessee Park. Right-hander Josh Smith (4-1, 4.31) starts for Nashville against left-hander Brian Flynn (5-3, 5.40) for Omaha. First pitch is scheduled for 7:05pm.